In 1796, after the Revolution, the first United States Consulate in Britain was established in Bristol, in Queen's Square. Notwithstanding the political pleads of London, the newly independent colonies of the new continent decided they would benefit more by establishing their representatives in Bristol. The trade that existed before the War of Independence was suspended for over ten years, but this was causing such a hardship on both sides of the Atlantic, and especially in Bristol. John Cabot, who discovered North America in 1497, sailed from Bristol. Richard Ameryk, the man after whom America was named, was a Bristol politician and merchant. His daughter is buried in St Mary Redcliffe church. In 1497, John Cabot, on the ship “Matthew” landed at a beach on North America, probably in Maine. He mapped 900 miles of coastline in Nova Scotia on his way back to and past Newfoundland. Bristol seafarers had actually been there before. They had been sailing to Iceland since the 1440s and to the New Found Land fishing banks since about 1480, catching or even purchasing fish, perhaps from Basque fishermen. John Cabot and Christopher Columbus were both trying to reach China. Both knew about the voyages that Bristol fishermen were making to Newfoundland in the 1480s and both Italians thought that the Bristol ships had in fact already reached China. 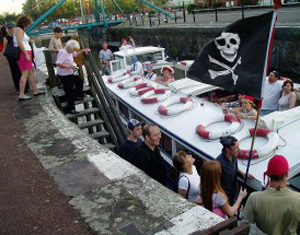 Cabot went to Bristol in 1494 and asked to be taken there on a Bristol ship. The merchants took him on the “Matthew” and on 24 June 1497 they landed at a beach on North America, probably in Maine. Cabot was an explorer who wrote about his voyage and it is he who gets the credit for being the first European to stand on North American soil. Richard Ameryk was the King's customs officer for the port of Bristol who paid Cabot’s yearly pension of £10, and he was probably financially involved in the venture. He almost certainly gave his name to some geographical feature on Cabot’s map, which within ten years was used prominently on Waldseemuller’s famous “World Map” to describe part of the continent. The name “America” would soon be used for the entire landmass. Just as Italians, Columbus and Cabot, got credit for discovering America, instead of the Bristol merchant fishermen who got there first, another Italian, Amerigo Vespucci is supposed to have given his name to the continent, and not the Bristolian Richard Ameryk. Martin Pring, who mapped and opened up New England is buried in St. Stephen’s Church, Bristol. Martin Pring (approx 1580-1626) is credited with exploring, mapping and opening up New England to settlement. He was placed in command of a voyage to New England, or northern Virginia as it was then known, by a group of Bristol merchants in 1603. Captain Gosnold had made a similar cursory unauthorised voyage in 1602. This group of Bristol merchants underwrote this voyage to discover and exploit commercial opportunities along the coast. Pring’s backers focused primarily on the valuable sassafras Gosnold had discovered, but unlike Gosnold, they first secured Sir Walter Raleigh’s permission prior to undertaking their venture. They left Bristol on April 10, 1603 in two ships, and reached Maine and New Hampshire in the late spring. Pring on the flagship Speedwell, and the bark, Discoverer, explored the islands, rivers, and harbors of New England, including the Piscataqua, Saco, Kennebunk, and York Rivers. They sailed south to present-day Plymouth Harbor and to the Elizabeth Islands south of Cape Cod. The Discoverer sailed home first with a boatload of sassafras. Pring and his men had an encounter with the local Indians who tried to attack their ship. The Speedwell departed in August and reached Bristol seven weeks later, on October 2, 1603. In 1606 Pring returned to New England as master of Captain Hanham’s ship and mapped the coast. From 1613 to 1621 he was employed by the Dutch East India Company and rose to commander of naval forces for the entire Company. He returned to England in 1621, was made a freeman of the Virginia Company and given two hundred acres. Martin Pring died in 1626 and is buried in St. Stephen’s Church, Bristol. Many of the original settlers in the area south of Boston were from Bristol and Somerset and many of the place names are taken from “home”. This area was originally part of the Plymouth Colony and was incorporated in 1685. Bristol, Rhode Island was the county seat originally. The county was split when Rhode Island was formed and Taunton has been the county seat of the Massachusetts part of the county since 1746. During Colonial Times, the county was prominent in shipbuilding, metalsmithing, pottery making and they developed some of the nation's earliest textile mills. Bristol, Rhode Island, was a major seaport, rum and sugar importer, and slave centre. This was very similar to Bristol, England, and there was a lot of shipping traffic between the two ports. The French Hugenots who left from St.Augustines Quay to set up the colony.. They worked as weavers at the Baptist Mills site but King William III kicked them out..
Admiral William Penn, after who Pennsylvania is named, is buried in St Mary Redcliffe church. Philadelphia, of course, was founded by his son, William Penn. But there are many connections with Bristol in the area. Bristol Borough, Pennsylvania, is the state’s oldest borough, as the first formal settlement, founded in 1681. Is located some thirty miles north of Philadelphia, on the Delaware River. The first Europeans to settle in this part of Pennsylvania were the Swedes and Dutch, from 1625. However, the English took possession with William Penn’s land grant from the King in payment of a debt to Penn’s father. Bucks County is named for Penn’s home in England - Buckinghamshire. Bristol Township was incorporated in 1692 as Buckingham Township. The name was later changed to Bristol in 1702. There is also a town called Bath, the site of a hot springs. Opened in 1720, Bath attracted the wealthy from Philadelphia to its water and the resort of Bath was developed. Philadelphia, Pennsylvania was formed by a Proprietorship, as were most of the settlements south of New York. Bristol businessmen were in the vanguard of these endeavours. Apart from the Penn family, the Markham’s from Bristol were very prominent. Governor Markham was Pennsylvania’s first governor. 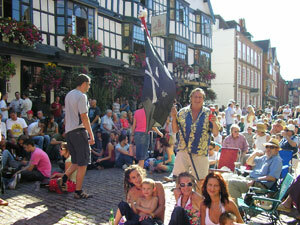 Blackbeard the pirate, another Bristolian, otherwise known as Edward Teach, was another frequent visitor. He was an acquaintance of Gov. Markham and he had a lady friend, Margaret, who lived at Second and Vine, and a favourite tavern in that area, now known as Penn’s Landing. 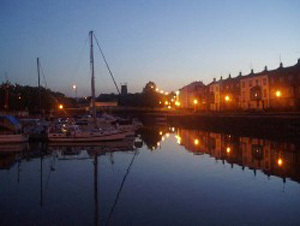 The Tred Avon River takes its name from Bristol’s River Avon that empties into the Bristol Channel. Eastons is now in Bristol. Easton, Talbot's county seat, is just one mile from the headwaters of the Tred Avon River, and is supposed to have been named for this English town. In colonial days there were many merchant vessels trading between Oxford, Maryland, and Bristol, England, near which Easton, England, and is from where many of the early settlers of Talbot County emigrated. In 1686 nineteen tobacco ships arrived in Bristol in one convoy from Virginia loaded with tobacco. Bristol has been a major market for Virginia and North Carolina tobacco. Regrettably, Bristol slave ships supplied half the slaves to Virginia in the first half of the 1700s. After blockading Charles Town, South Carolina, Blackbeard headed north to North Carolina, specifically the town of Bath, on Pamlico Sound, where he knew the governor, Gov. Eden. On June 10, 1718, his ship, the “Queen Anne's Revenge”, ran aground entering Pamlico Sound and was abandoned near Beaufort, North Carolina. He decided to stay the summer in Bath. From July - October 1718 Blackbeard settled briefly in Bath, and married his 14th wife. However he was soon attacking ships again off the Chesapeake. On November 22, 1718, Blackbeard was killed by a British Navy force at Okracoke Island, North Carolina. He was ambushed by the Royal Navy and decapitated. The “Queen Anne's Revenge" is currently being salvaged near Morehead City, North Carolina, where it ran aground. Sir John Yeamans, who later founded Charleston, South Carolina, established a colony at Cape Fear in 1664. However it failed after about 3 years. Yeamans was christened in St Mary Redcliffe church and his father owned the largest brewery in the city. His brother, Sir Robert Yeamans was Mayor of Bristol in 1669. Carolina was settled by the Carolina proprietorship. Two of the eight Proprietors were the brothers Lord John Berkeley and Sir William Berkeley, who was Governor of Virginia. The Berkeley estate is just 25 miles north of Bristol and they had strong business interests in the city. Sir John Yeamans was appointed by the Proprietors to settle a colony and he founded Charleston, South Carolina in 1671. He was christened in St Mary Redcliffe church and his father owned the largest brewery in the city. His brother, Sir Robert Yeamans was Mayor of Bristol in 1669. Sir John Yeamans (as he later became) was one of the early settlers on the Caribbean island of Barbados in the 1630s where he owned a sugar plantation. In 1671 he established the Proprietorship colony in Charles Towne, Carolina. He has the dubious distinction of importing 200 slaves and introducing slavery on a large scale to North America. He became the Colony’s 3rd Governor only because he did not actually arrive with the original settlers having returned to Barbados to take care of other business. When he arrived several months later the 80 yr old governor he appointed in his absence had died and he then had to remove his replacement. He established a plantation in Charles Towne but died of disease there in 1674. The Wraggs, another prominent Charles Town family, originated in Bristol. Blackbeard, the Bristol pirate, made his infamous mark on Charles Town, South Carolina. At the end of May 1718, he began a week long blockade of Charles Town, robbing at least nine ships entering or leaving the harbour. Regrettably, Bristol slave ships also supplied half the slaves to Charles Town in the first half of the 1700s. Second Lieutenant Peter Puget was the second officer on board the HMS Discovery, commanded by Captain George Vancouver from 1757-1798. He was enrolled as a Captain’s Servant in 1778 at the age of twelve, serving in the West Indies, Gibraltar and the English Channel before being appointed as a lieutenant on the sloop Discovery. In May of 1792, while on a four-year voyage around the word, they sailed through the Straits of Juan de Fuca to discover a "sea in the Forest." Lieutenant Puget was assigned to job of exploring and surveying the shorelines of this inland sea. Subsequently, Captain Vancouver named this sea "Puget's Sound" to commemorate Puget's dedication to duty and outstanding service. Captain Vancouver died at the age of 42 in England and failed to publish his account of this world tour. Captain Puget assisted Captain's Vancouver's brother in completion the three volume record of the HMS Discovery's four-year voyage. On his retirement from the Navy and return from India the Puget family moved first to London, and then Bath, where Sir Peter could get treatment for his gout. He died there in 1822. Admiral Puget is buried in a small a country churchyard in Woolley, near Bath about 12 miles from Bristol.